Free Shipping Included! Sterling Silver Rose Tone Italian High Polish Alternating White & Grey Square Moonstone 36'' Station Necklace by Beaux Bijoux at SCRHI. MPN: amsmm5808. Hurry! Limited time offer. Offer valid only while supplies last. Add this stunning Sterling Silver Rose Gold Italian High Polish Alternating White & Grey Square Moon Stone 36'' Station Necklace to your jewelry collection! This beautiful piece is a one of a kind necklace due to the classy design it possesses. 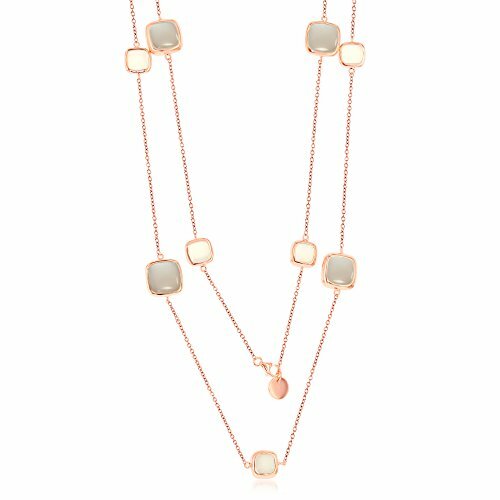 The necklace is gorgeously designed with five 12mm square bezel set natural white moonstone followed by for 16mm square bezel set grey moonstones. The meticulous color choice makes a great combination and it's easier to pair this up with another necklace. The stones are linked by the rose gold cable chain which reaches up to 36 inches. Additionally, the lustrous color of rose gold ties the whole look due to the glistening sheen it gives off when it makes contact with the light. This is a stunning piece of jewelry that is sure to make a statement to any person that possesses it. PERFECT GIFT: This is the perfect gift idea for many occasions, such as Mother's Day, Valentine's Day, Christmas, Graduation, Wedding, Bridal, Bridesmaids, Religious Event, or any other Special Event. GUARANTEE: We stand behind all our products and will replace any item received damaged- a happy customer is our main goal. PACKAGING: This piece of jewelry comes enclosed in a beautiful gift box with a striking white bow. If you have any questions about this product by Beaux Bijoux, contact us by completing and submitting the form below. If you are looking for a specif part number, please include it with your message. 14K Two-Tone Yellow and White Gold 1.5mm Solid Figaro Pave Chain Necklace- 30"